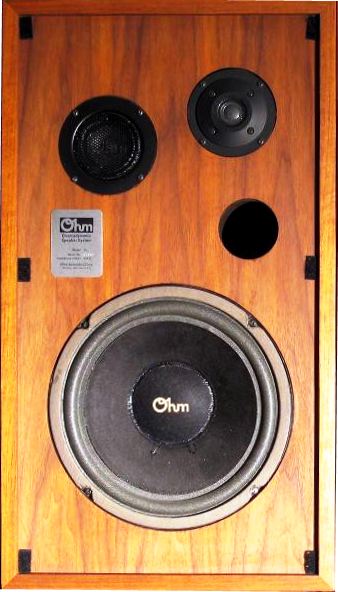 The Ohm C2 bookshelf speaker was introduced to the US market in 1977 and had been sold for 5 years until 1982. Considering the original retail price of $695, the C2 is clearly positioned in the high-end market. At its time, its was Ohm´s most successful and most widely known bookshelf speaker. It is a three-way speaker, having a 10 inch woofer and two tweeters (one low -, one dome super tweeter). At the back of the speaker a level controller is located to adjust the highs. An interesting fact to know is that the foam surroundings of the C2 are reversed, meaning that the bulge is directed towards the inside. However, there are apparently only refoam kits available that have the bulge towards the outside of the speaker. It is therefore quite easy to see, whether a speaker had been refoamed. After refoaming a C2 myself (See restoration guide: C2 project), I was not able to hear any decrease of sound quality after installing the foam surrounds in the "non-reverse" position. However, Ohm probably had its reasons to reverse the foam surrounds and if you can really find a reversed refoam kit for this speaker, you should make an effort to get it. The Ohm C2 speaker is one of those vintage speakers you should look for, if you are willing to put a little effort in restoring them. In good condition a pair is usually sold somewhere between $150 to $200, but you will find it at garage sales and thrift stores for $20 to $40, as many need to be refoamed. A refoaming kit for this speaker is available for about $30 and in case you really need to find individual parts of the speakers you can purchase them directly at www.ohmspeakers.com or in used condition on ebay. Occasionally, there are a few overpriced C2s on ebay for up to 400$, but I have not yet found one that has been sold. Conclusively, I believe that a fair price for a pair of C2s in decent condition lies around $80 to $150. OHM C2 Price: $80-150 in good condition up to $250. I have a pair of C 2's I purchased in 1977. Am in process of upgrading the woofers. Sent woofer frame and magnets to Ohm for upgrading with what they call SBA and poly cones. We will see/hear the results soon. May upgrade high tweeter in future. They are nice looking speakers. Especially with out grills on. Tung oil on veneer make them shine like new. Upgraded C2 woofers from Ohm for cost of about $325 with shipping. Am following up on previous post. Am happy with the results. The C2's sound better than ever. Ohm claims they will take up to 200 watt amp now. They are a nice warm sounding speaker. Also have Ads880's which I like about as well. My room acoustics could be better which limits my ability to give you more indepth review. There were some problems with rebuilding my old woofers but Ohm came through with replacements. Can recommend them. Who else upgrades speakers that you have had for 37 years? I recently purchased a pair of C2's that need refoaming. The "restoration guide: C2 Project" link doesn't work. Anyway you could put that back up? Thanks! I just acquired a set of c 2, s.
How do you know when they need refoaming? I have the Ohm C2s I bought in 1978--I spent more for those speakers than the car I owned then! About 6 years ago, I needed to re-foam the woofers and bought the kit from Ohm. Cost about $300/pair, and worth every penny. Only thing wrong was I needed to upgrade my receiver to take advantage of the new sonic capabilities. Went from a 70 watt/channel Sony to an H-K 3490 at 120W/side. I can crank it to absolute maximum volume, and the sound is gorgeous. I listen mostly to rock-n-roll, but Beethoven's 9th by the Szell-led Cleveland Orchestra at maximum volume can make a grown man weep. Had mine for 47 years and took the easy way out and replaced them with some 10" Rockford Fosgates series one at about $80 apiece. Personally I think they sound better in the low end. Know the purists will cringe, but I think they look great and sound wonderful. I do have one miner criticism about your comment that the C2 was Ohm's most successful speaker. It was not, that recognition should go to the Ohm model L. It was THE most sold speaker that Ohm produced in those days. I had a buddy who worked at Ohm when they were on Taaffe Place in Brooklyn. Got my pair of Ohm L's on 9-22-1978 at tech hifi (45th street NYC) for $356. Still use them. They are almost 40 years old.